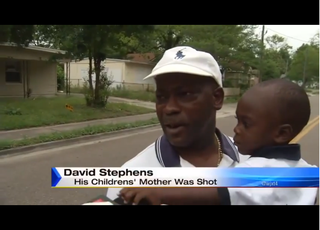 David Stephens of Jacksonville, Fla., apparently found himself in a serious predicament earlier this week after the 24-year-old mother of his two children was shot in random gunfire: caring for his kids, according to News4Jax. Stephens has two children with Davis, who is in serious but stable condition at a Jacksonville hospital. She was shot about 10 p.m. last Sunday while walking to down a street in a rough part of the city, the report says. A friend of Davis’, 16-year-old Charles McBride, was also shot, along with 39-year-old Jermaine Jackson, who is not a Davis acquaintance. News4Jax crime-and-safety analyst Gil Smith said that it is difficult to solve crimes in the area where the shooting occurred, which is known as Grand Park. He said that people are afraid to speak to police out of fear of backlash from criminals. So far this year, there's been one murder, 18 burglaries and one robbery in the area, according to the Jacksonville Sheriff’s Office crime map, the report notes.